Things to Consider Before You Prepay Your Mortgage. What Causes Mortgage Prepayment Plans to Fail? No Compass Vs. A Faulty Compass. Based on your entries, this is how much you still owe (principal balance) on your home loan after deducting all of the principal payments you have already made. Based on your entries, this is the amount of your current monthly principal and interest (PI) payment. This does not include property tax or insurance payments. Based on your entries, this is your current monthly payment plus the prepayment amount you entered in the top section of the prepay mortgage calculator. Based on your entries, this is the number of months you will shorten your repayment term by if you add the entered prepayment to your mortgage each and every month. Based on your entries, this is how much interest you will save if you prepay your mortgage by the monthly prepayment you entered. 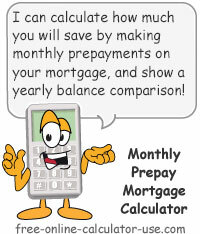 This calculator will calculate the time and interest you will save if you prepay your mortgage by adding a prepayment amount to your current house payment. Plus, the calculated results will include a year-by-year balance comparison chart so you can compare the year-end balances of your original mortgage terms with the year-end balances that will result from making your monthly prepayment amount. Or if you would like to calculate the savings for a combination of one-time, monthly, and annual prepayments, please visit the Extra Payment Mortgage Calculator. Or, if you don't plan to stay in your current home until the mortgage is paid off, please visit the Mortgage Savings Calculator to calculate prepayment savings for partial home loan terms. Enter the monthly prepayment amount you can afford to add to your current payment. Things to consider before prepaying, and what causes prepayment plans to fail. If you have other debts that have a higher interest rate than your mortgage, you will save a lot more money if you pay off the higher-interest debt first, and then redirect those higher-interest debt payments to paying off your mortgage. If your employer matches all or part of your 401K contributions, you might come out ahead by contributing the prepayments to your 401K instead. So be sure to run your plans past a qualified financial planner (one who will not be earning commissions from your investments, and who is not trying to sell you life insurance) before starting your mortgage prepayment plan. Check with your lending institution to make sure you can prepay your mortgage without penalty. Believe it or not there are lending institutions out there that will fine you for tampering with their forecasted profit margins -- despite the fact that they will still make a ton of money on your home loan. Also check with our mortgage lender to make sure they won't just escrow your prepayments and apply them at the end of the loan instead of as you make them. Can You Really Afford to Prepay Your Mortgage? In my experience most home buyers enter into mortgages based solely on whether or not they can afford to make the monthly payment. And while the monthly payment typically includes property tax and insurance payments, it does not include the other ongoing costs that come with owning a home. Although some people do include the ongoing cost of utilities in their "how much house can I afford?" equation, what gets most people into trouble is that they assume that everything that comes with the home, or is later added to the home, will all last forever. In other words, they fail to consider "depreciation expenses" when determining whether or not they can afford to buy a particular home. This results in buying more home than they can actually afford. Whether you choose to acknowledge depreciation or not, everything other than the land the home sits on will eventually wear out and need replacing. And while the foundation and basic structure of the home may last for generations, nearly everything else will need to be repaired, upgraded, or replaced an average of once every 15 years. This list includes things like appliances, furniture, fixtures, heating and cooling units, floor coverings, roof coverings, wall coverings, septic systems, pavement, powered lawn equipment, and so on (all commonly referred to as "depreciable assets"). The reason I point this out is because failing to account for the repair and replacement of depreciable assets is what causes most mortgage prepayment plans to fail. After all, if you have not made an honest effort to forecast the depreciation expenses of your home's depreciable assets, and/or you are not setting aside funds to cover those costs as they occur, the "extra" funds you are using to prepay your mortgage are not really "extra" at all. And if that's the case, all the money you thought you would save by prepaying your mortgage will be wiped out when you are forced to take out a second mortgage in order to replace all of the depreciable assets you failed to budget for. Not having any financial plan for the future. Following an ill-conceived financial plan that is destined to fail. In my opinion, following a financial plan that is destined to fail is worse than having no plan at all. If you were lost in the woods, which would would be worse; having no compass at all, or having a compass only to find out after days of heading "due North" that the compass had been making ever-changing, slight miscalculations as to which direction was North? I would argue that not having a compass would serve you better than having a faulty compass, because if you had no compass at all you probably would have been a lot more careful in attempting to find your way out (following the sun, leaving breadcrumb trails, marking trees for walking in a straight line, etc.). The same is true of personal financial management. If you are blindly following a plan that is unknowingly leading you to walk in financial circles, or walk deeper into the financial woods (debt), you will likely end up more lost and disappointed than if you had no plan at all ... because you will not be proceeding with the same level of cautionary decision-making. If you agree that making plans that are destined to fail will likely result in greater loss and disappointment, and if you are not faithfully setting aside the funds needed to replace your depreciable assets as they wear out, you might consider setting aside your prepayments to cover depreciation expenses instead of using them to "temporarily" prepay your mortgage.